For the second straight year, the CIBC Canada Russia Series heads east to the QMJHL tied at six points apiece. Series splits for both the WHL and OHL in a quartet of low-scoring, tight-checking contests puts the ball in the court of Team QMJHL, who claimed supremacy in the first ever series shootout finale last year in Moncton. Team QMJHL features 10 players that attended Hockey Canada’s Summer Showcase in Kamloops, BC this past August, including three each from the Drummondville Voltigeurs (Olivier Rodrigue, Nicolas Beaudin, Joe Veleno) and Halifax Mooseheads (Raphael Lavoie, Jared McIsaac, Antoine Morand). 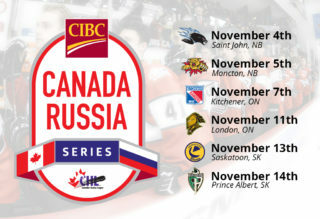 During tomorrow and Thursday’s games at the @CIBC #CANvsRUS Series, the QMJHL will be showcasing some outstanding players! Seventeen-year-old Rimouski Oceanic star Alexis Lafrenière also headlines the Team QMJHL roster. The former first overall QMJHL Draft pick and top 2020 NHL Draft prospect sits tied for second in league scoring with 36 points (12-24–36) over 21 games. Tuesday’s quick Game 5 turnaround in Sherbrooke comes on the heels of a Team Russia 4-0 win over Team OHL in Oshawa, Ont. as goaltender Pyotr Kochetkov stopped all 23 saves he faced in the shutout win. The Russians will benefit from the addition of QMJHL leading scorer and San Jose Sharks prospect Ivan Chekhovich (Baie-Comeau Drakkar) who has 37 points (19-18–37) over 22 games this season. Minnesota Wild prospect Alexander Khovanov (Moncton Wildcats), Calgary Flames pick Dmitry Zavgorodniy (Rimouski Oceanic) and Nashville Predators choice Pavel Koltygin (Drummondville Voltigeurs) also slot in up front. Canadian National Junior Team assistant coach Jim Hulton (Charlottetown Islanders) takes over behind the bench in Games 5 and 6 as he tries to get the QMJHL’s top Canadian-born talent on the same page in short order. Welsh, Hulton’s netminder in Charlottetown, will get the start in Game 5 tonight as Team QMJHL looks to get an edge on Russia when the puck drops at 7 ET/4 PT at the Palais des Sports Léopold-Drolet. Top 2019 NHL Draft prospect Samuel Poulin (Sherbrooke Phoenix) will play before the home crowd. The QMJHL carries an all-time record of 17-10-3 into tonight’s contest.